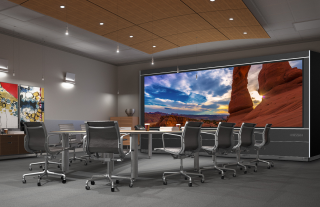 Prysm, Inc., a display and visual collaboration solutions provider, will publicly debut its Laser Phosphor Display (LPD) 6K Series, an interactive single panel large-format display offering a panoramic image uninterrupted by seams or bezels, at InfoComm 2018. Additionally, the company is announcing new partnerships for the LPD 6K with First Video Communications (FVC) in the Middle East and Daheng in China. FVC and Daheng are providing LPD 6K installation and support services to local resellers to help assist customer deployments in their regions. In North America, customers have already bought the LPD 6K from resellers, including AVI-SPL, Diversified, IVCi, SKC Communications and Unified AV. Since becoming available, Prysm has completed many customer installations of the new display at a variety of leading companies. Adding to this success, Daheng recently finished its first customer installation of the LPD 6K with People’s Daily, one of China’s largest newspaper groups.